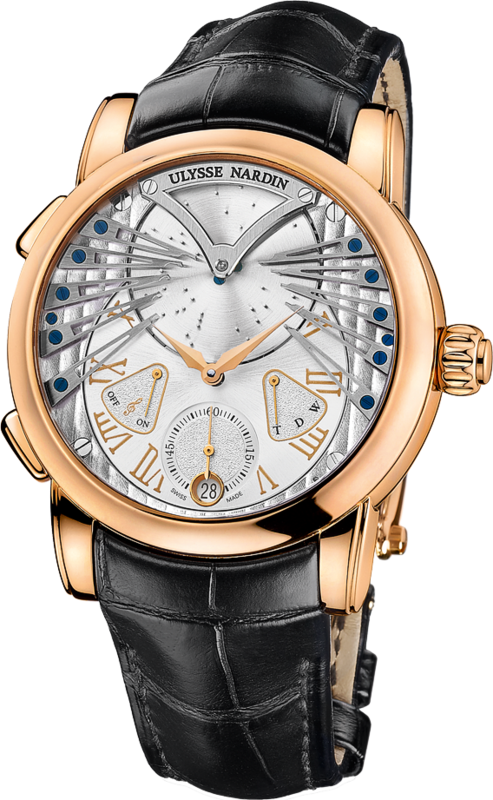 Ulysse Nardin Stranger visually presents time with an engaging audible experience for an infinite relationship that’s absolutely timeless. 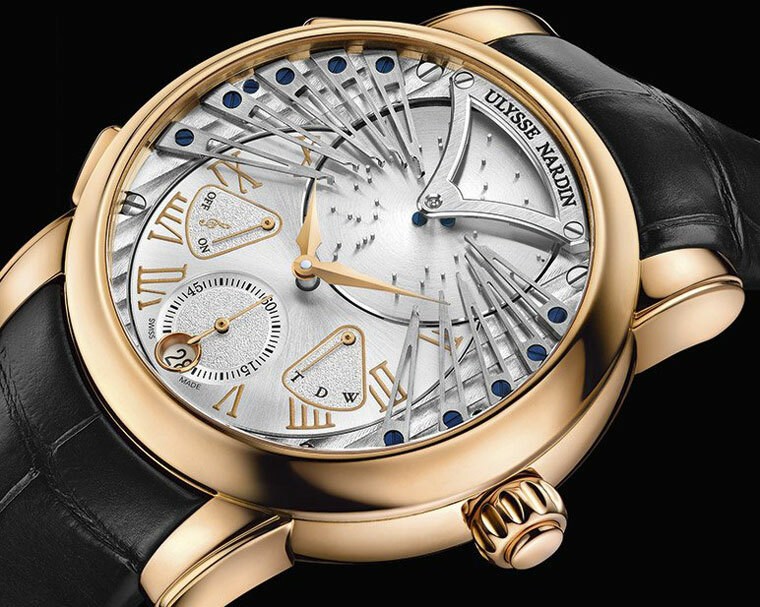 Finally a watchmaker has developed a watch that serenades its wearer with both a visual and audible experience upon first glance (a personal experience I have always had when glancing at a luxurious watch – someone over at Ulysse Nardin has been tip-toeing through both my auditory and visual tulips). All joking aside, you really have to ask yourself, “If my watch doesn’t serenade me, what kind of time-telling relationship do we actually have?” Ulysse Nardin has apparently answered this question and has taken the timepiece relationship to another level that equates to timeless love, and with of all watches – Stranger. Stranger (Reference 6902-125) is Ulysse Nardin’s aesthetic and complications masterpiece that passionately marries time and music in an ethereal classical music box form serenading its wearer with an ever alluring song, “Strangers in the Night” (a song that was immortalized in 1966 by none other than velvety smooth crooner Frank Sinatra). Stranger is an innovative timepiece that required five years of development just to bring it to fruition, which was inspired by Ulysse Nardin’s partner, conceptual artist and musician Dieter Meier (aka the Godfather of Techno-Music). Stranger artistically sings with an ornate dial that displays a rotating disc that engages 10 elaborate blades thereby producing the music of “Strangers in the Night”, very much like a music box. A pusher located at 10 o’clock can also activate (or deactivate) the disc to play the melody, which can be programmed to play on the hour or not at all. Another pusher at 8 o’clock must be engaged to activate the crown which is pushed to activate functions: “T” for time, “D” for date and “W” for wind as shown on a triangular display between 3 and 4 o’clock on the dial. Stranger’s plays music and time in a beautiful 45mm 18K rose gold case displaying a harmonious dial accentuated with 18K rose gold Roman numerals, a round date aperture window, hour/minute hands and a sub-dial seconds indicator hand. Enclosed is Ulysse Nardin’s silicon technology for the escapement, anchor and balance spring, of its in-house automatic mechanical UN-690 movement; 64 jewels and 48-hour power reserve function. It has a medallion caseback and is adorned with a black leather strap with folding buckle. 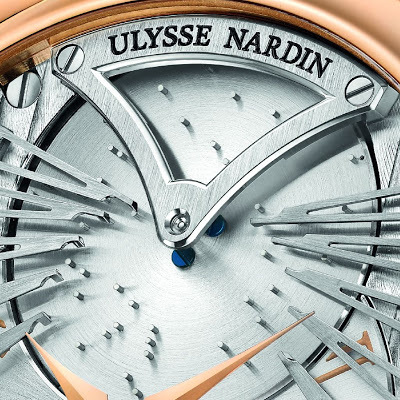 Ulysse Nardin Stranger is a limited edition timepiece of 99 pieces, and as such will sing its alluring song for a special collector. 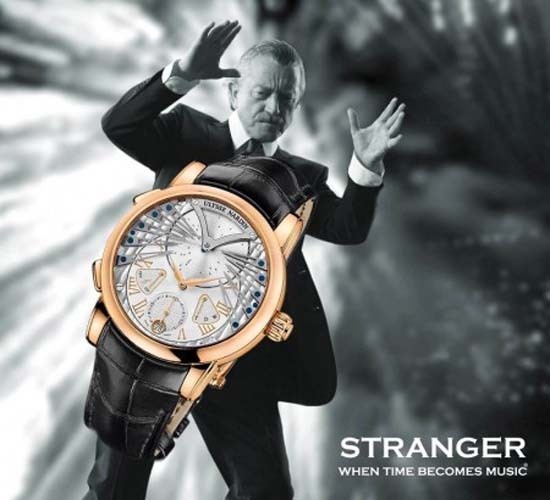 Stranger can be visually and audibly appreciated in all of its splendor at BaselWorld 2013. An announcement this week from Ulysse Nardin has given watch lovers and deep sea divers something to get very excited about: the Black Sea Chronograph. The Black Sea Chronograph is the newest in Ulysse Nardin’s line of Black Sea water timepieces, and it certainly lives up to it’s predecessors. In addition to the typical chronograph face, there is a date indicator at the 4 o’clock position. Next to the date indicator, at the 6 o’clock position, rests a 12 hour counter. The Ulysse Nardin anchor is emblazoned across the main dial, and is also delicately attached to chronograph seconds hand. The 45.8 millimeter case is crafted from rubber-coated stainless steel, and features a sapphire crystal case back. The strap is also crafted from rubber for unlimited comfort, as are the rubberized pushers, increasing the functionality of the piece. The buckle and other smaller portions are made using ceramic. The Black Sea Chronograph is self-winding with a power reserve of approximately 42 hours. With the addition of a rubberized screw crown, the Black Sea Chronograph is water resistant up to 200 meters. The Black Sea Chronograph also features glowing capabilities in dark situations. With stunning design and stunning functionality, the Black Sea Chronograph is sure to leave those who see this timepiece on your wrist more than just a little green in the gills. To learn more about Ulysse Nardin and the Black Sea Chronograph, visit www.ulysse-nardin.ch/. 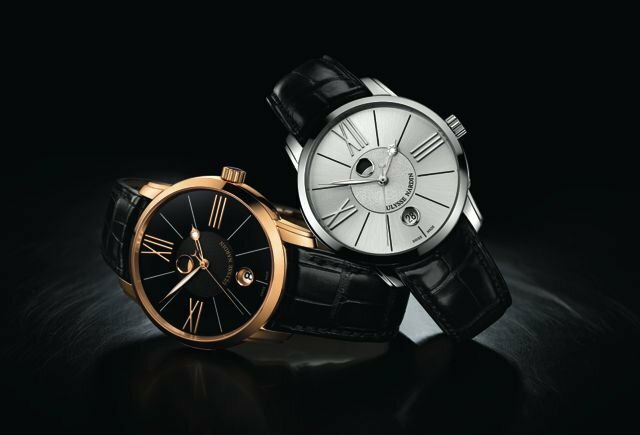 Swiss watchmaker Ulysse Nardin has long been known for creating a variety of luxury watches ranging from the classic and elegant to sporty and stylish. The brand’s newest addition the Freak Diavolo is somewhat similar in design to the original Freak and its variations. It debuted about ten years ago and continues to have a very strong following to this day. The brand even calls the Freak “a game changer in haute horology.” The new Freak Diavolo is not a replacement for the original Freak but a tribute and a new and improved version of the “freakish” original. Freak lovers will appreciate the new Freak Diavolo’s tourbillon complication as well as the characteristics of the original Freak watch that made it so different and striking in the first place. These features include a silicium constructed escapement wheel and a luxury watch without a proper dial, crown or hands-all of which were a first for watches. 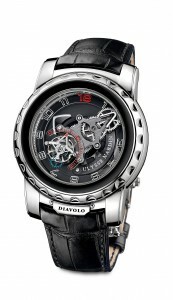 One might be reluctant to wear a watch without those basic components however, the Freak Diavolo is not hard to read. Rather than doing a side by side comparison of the original Freak and its variations and the new Freak, let’s focus on the Freak Diavolo. The Freak Diavolo measures 44.5 millimeters in diameter and comes equipped with an 18 karat white gold case fashioned to a black leather strap. 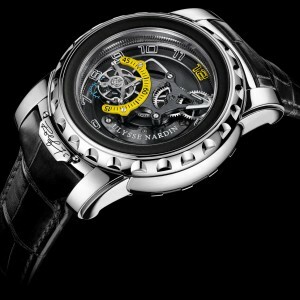 It also features a manual wind, sapphire crystals and a very generous eight days of power reserve. Unfortunately for athletes, the Freak Diavolo was made as an example of time-keeping art and was not made for violent shocks, knocks or use in water. It is resilient in that it can take occasional splashes of water and ordinary environmental wear without any ill effects to the precision time-keeping. Upon first glance, the Freak Diavolo might appear to be more of a piece of wearable art rather than a complex timepiece. However, if you review the setting instructions of this piece you will see that this watch is certainly complex and require a lot of attention to detail. The Freak Diavolo is much more than a gimmick or trendy watch. With that said, the Ulysse Nardin Freak Diavolo watch makes an exciting and handsome addition to any watch collector’s compilation. This timepiece is comfortable, fascinating to look at, precise and carries just enough shock value for a luxury watch to keep things interesting. If you are looking for a watch that will add some excitement and charm to your normal rotation of watches, you’ve found your match! Between looking for quality mechanics, innovative functions, and a modern aesthetic, watch enthusiasts often seem to be asking for the moon. Luckily for all, Ulysse Nardin is willing to deliver just that with their lunar-inspired Ulysse Nardin Classico Luna watch. Track time, moon, and style with this new gem from Ulysse Nardin. The timepiece combines the classic mystery of the moon with the brand’s age-old commitment to innovation as forward as it is elegant. The moon is no stranger to time; our own modern calendars are based on the moon’s motions while peoples across the world throughout time have based the counting of days off of the moon’s movements. With automatic movement and all of the precision machinery standard for any Ulysse Nardin watch, the timepiece not only accurately keeps track of time, but also tracks the moon rotation and its angle of illumination. It would be difficult to find a watch more precise in telling the phases of the moon than the Classico Luna. 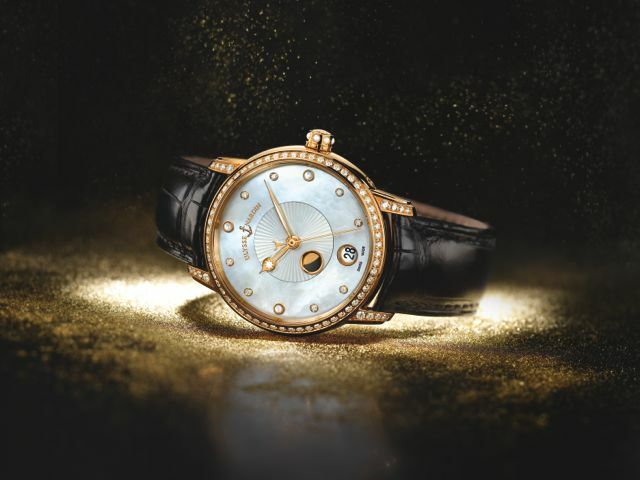 As beguiling and luminescent as the moon itself, the Classico Luna is a pearl in the universe of timepieces. Available in both male and female versions, the gentle glow of the stainless steel or gold case sets off the dark backdrop of the black dial and silvery accents. While the male version of the watch is a pleasure to look at, the Classico Lady Luna goes the extra mile. Perhaps because there are so many tales linking feminine mystique to the moon’s own charms, ranging from Greco-Roman tales of the moon goddess Diana to Japan’s mythology of a moon princess, Ulysse Nardin added a few of more elements to the ladies’ timepiece to glow. The female version also includes the option for a ring of diamonds to encircle the face of the “Luna,” adding an extra sparkle to the piece. Ladies have the choice of the dark colors of the night or the soft radiance of a mother of pearl dial. All versions sport a comfy alligator wrist band and precision craftsmanship of Ulysse Nardin watches. The combination of the light and dark elements adds an extra glow to the timepiece that is singular to this piece. As beautiful as the moon but twice as functional, Ulysse Nardin Classico Luna Watch combines all the classical energy of the moon with the watch brand’s own commitment to producing quality pieces for their wearers to enjoy. Big things are happening for Randy “The Big Unit” Johnson, legendary Arizona Diamondbacks pitcher. In early June, he was named new ambassador of luxury Swiss watch manufacturer Ulysse Nardin, a 166-year-old brand that Johnson has been known to enjoy wearing. On June 4, Ulysse Nardin CEO Patrik Hoffmann announced the new partnership at Chase Field in Phoenix, Arizona during an event for the Muhammad Ali Parkinson Center at Barrow Neurological Institute. 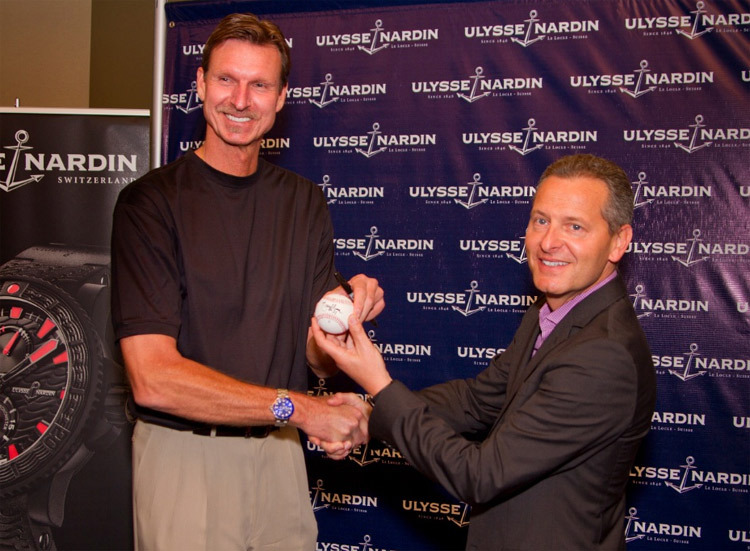 Ulysse Nardin and Randy Johnson began their professional relationship by being pictured holding a check for $5,000 to the Barrow Neurological Foundation Charity from Ulysse Nardin. Johnson, who is a five time Cy Young Award winner and ten time All-Star, gained legendary status on the pitcher’s mound with his unbeatable left-handed slider that he dubbed “Mr. 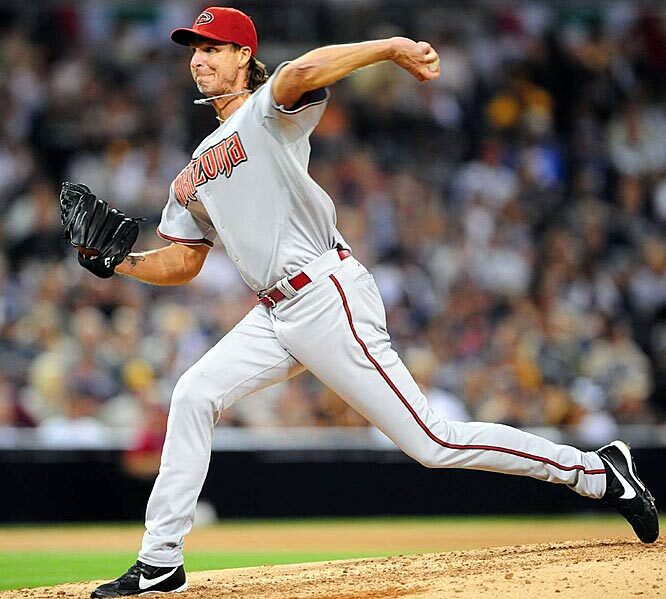 Snappy.” The nickname “The Big Unit” was affectionately given to him by fans commenting on his unnaturally tallness. 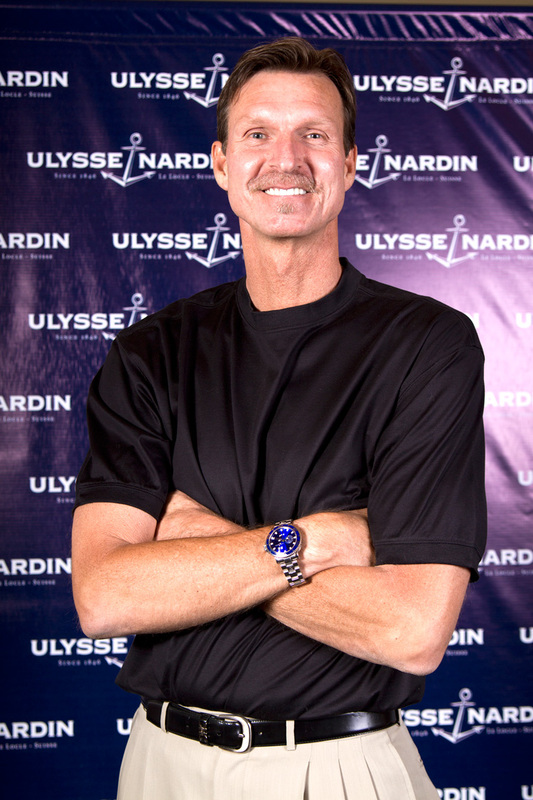 His passion for high-end timepieces such as Ulysse Nardin’s is what led to his ambassadorship with the company. “I am honored to be an ambassador for a company and brand that offers watch lovers like me perfection in quality, utility and style,” said Johnson. Since Ulysse Nardin’s founding in 1846, the Swiss watch manufacturer has been committed to creating excellence in its timepieces. With reliability and new technology as a top priority, Ulysse Nardin timepieces are sought after and collected all over the world. The timepieces are made with high-end Swiss parts that support high precision and incomparable mechanics. The partnership marks a new era of watch branding and ambassadorship. Johnson will be the first American to have a timepiece made exclusively for him. Said Johnson of this honor, “I am a huge fan of Ulysse Nardin’s timepieces, and am really looking forward to wearing the limited-edition ‘The Big Unit’ watch.” The timepiece will not be released in stores until the end of the year or early 2013 because it is still in the early stages of production.